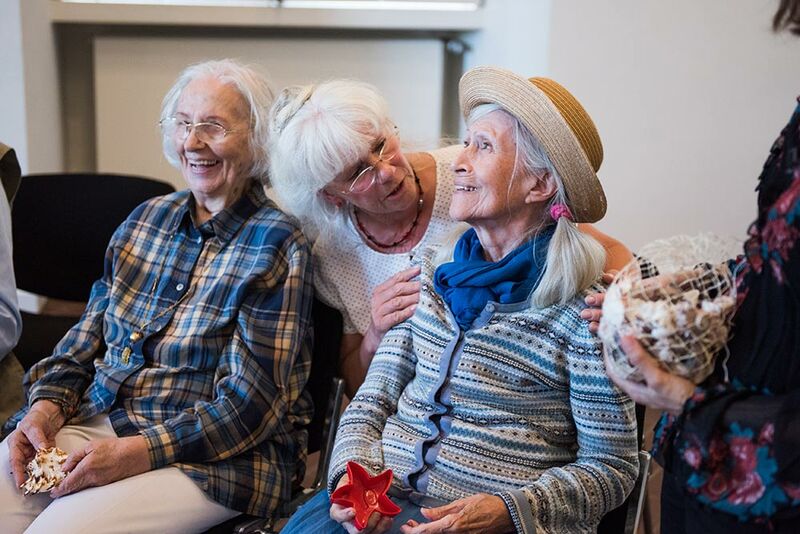 Colleagues and friends reacted with shock and surprise, but also great interest when I told them about my project: as a research trainee in the education department, I was given the task of developing programming for Jewish Museum visitors with dementia. I was very excited once the project concept had been finalized and we were ready to test it. We invited a group from an eldercare center. A minibus with the large logo of a Charlottenburg organization pulled up in front of the museum and Andreas Rath, manager and (for today) bus driver, energetically opened the door. Cheerfulness is part of the program. He introduced each of the six visitors to me with a rhyme. My anxiety fell away, and I knew things would turn out well! One woman used a wheeled walker, the rest were on foot. We walked a bit through the museum garden and noticed the little fruits on the Japanese crabapple tree. Frau Leßmann, a retired police investigator, asked the name of the tree. 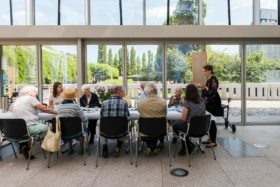 Taking New York’s MoMA as a model, many museums—especially art museums—now offer tours and talks for people with dementia. Paintings and sculptures are well suited for it, because people can have an aesthetic experience of art without traditional knowledge transfer. 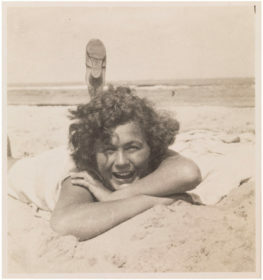 “Do you like this one?” “Why does the person in the portrait look so happy?” The focus lies on feelings and moods, in order to connect with the participant’s lifeworld. But could a program for people with dementia also work in a cultural history museum? In a Jewish museum? In the Glass Courtyard, a table has been laid with coffee and pastries and decorated with seashells and driftwood—a beach theme. 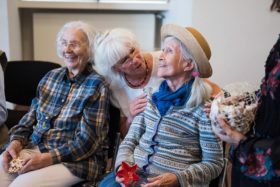 Ms. Baumgardt dauntlessly reaches for a piece of driftwood and says in disappointment “Oh, that’s not chocolate.” Ms. Horlemann, a former professor of literature, recites two limericks she wrote herself and tells stories from her life. She lived for a long time in the United States, but where exactly? You can see her dig deep in her memory, but the place won’t come to her. She says she’ll tell us later. Drinking coffee together is an important part of the program. The participants enter a calm, inviting atmosphere in this new environment and have time to get to know the guide. Besides, the topic of Judaism can be broached culinarily: little home-made challot are offered. 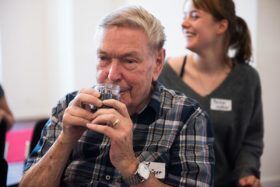 Our guide Muirgen Gourgues, who, along with four other guides, has received preparation from the Berlin Alzheimer’s Society, presents them as traditional baked goods from Jewish cuisine. The braided bread is a hit, and the caregiver asks for the recipe—soon they’ll also be making challah at their organization. One big question during our preparations was: how do we approach our central topic of Judaism? Dementia experts we talked to told us that the reactions could vary widely. Since childhood and youth tend to be more present for those with dementia than recent times, those born in the 1920s and 30s might be reminded of the National Socialist era, and of the stereotypes of Jews propagated at the time. How should we react if we were met with rejection or worse? Like in an art museum, we opt to then show the visitors images. Using selected photographs from our family collections, we want to give the participants a glimpse into the heart of our collection, allowing them to access it in a personal way. The first day of school, vacation at the seaside, a wedding celebration—special life events like these may be “reminiscence bumps” for those with dementia, which remain in memory for a long time. 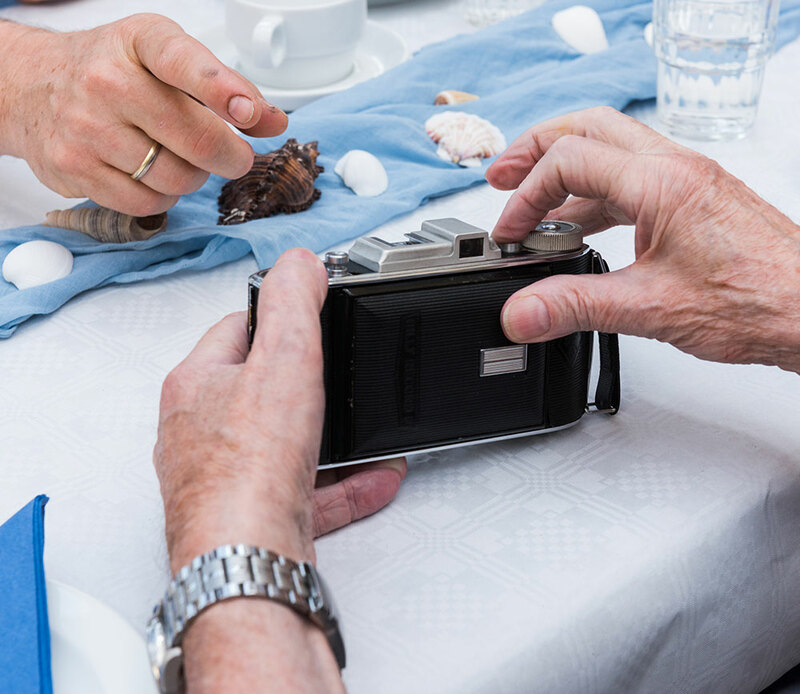 Family photos often follow certain patterns in terms of structure and arrangement, lending them a certain universality: we don’t know those pictured, but we nonetheless recognize our own memories in the images. And so we move from the bright and bustling Glass Courtyard to a slightly darkened auditorium. Chairs have already been arranged in a half-circle. The slide projector hums, click, the first photo appears on the screen: it’s 1929 and Ilse Winter is lying on the beach in Heringsdorf, smiling at the camera. Mr. Rath flatters the group a bit: “Ms. Horlemann, that must be you!”—cheerful laughter from the first row. 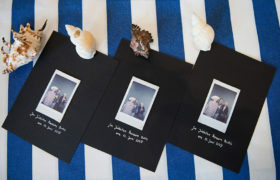 A CD player fills the room with beach sounds: the surf, cries of seagulls, as if we were on the beach at Usedom. A bowl with sand is passed around. The fine grains trickle through the participants’ hands, and the beach atmosphere is complete. The next photo shows the Simon family at the beach in Nahariya. Our guide Muirgen Gourgues says that the family emigrated from Germany to Israel. “Where did they live in Germany?” Ms. Leßmann wants to know. “What was Mr. Simon’s profession in Germany?” We’re surprised by the interest in the biographical details of those pictured. We had planned on taking a detailed look at the photographs, without incorporating too much background knowledge during our presentation. Instead, we’d planned this picture viewing as a sensory experience: smelling, hearing, feeling, tasting—we wanted to bring the photographs to life. Muirgen Gourgues opens a screw-top jar filled with algae and passes it around to sniff. “That smells like the sea,” Mr. Krüger determines. We play the old German hit song Pack die Badehose ein (Bring Your Swim Trunks), and some of the participants even sing along. 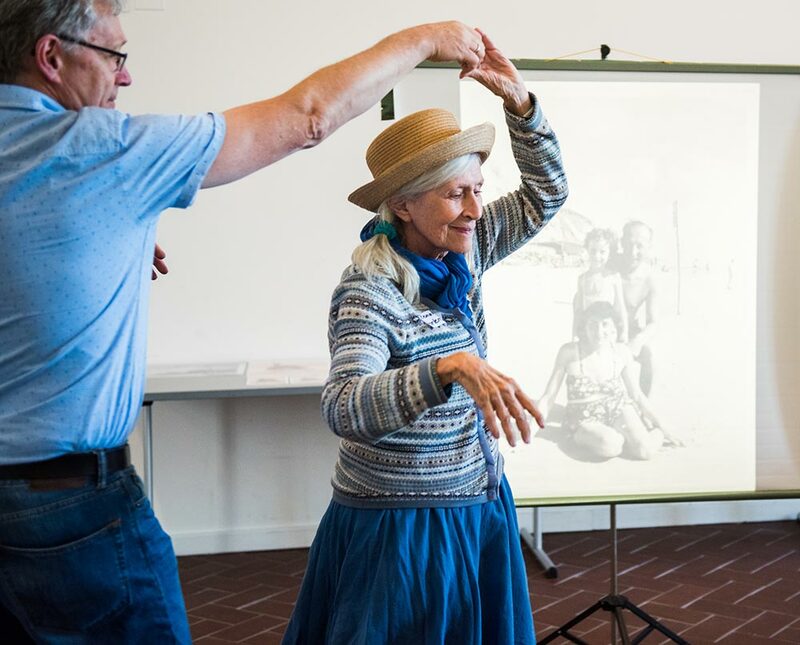 Caretaker Andreas Rath asks Ms. Horlemann to dance, and she turns skillfully on his hand, her white dress swaying. The other participants look on in amusement. Other museum visitors wandered into the room on accident twice. An older man pauses in the doorway while some of the participants sing Eine Seefahrt, die ist lustig (An Outing at Sea is Fun). He spontaneously joins in, and it seems he’d like to stay and take part. We look at two more photos from the family collections. The rule is that less is more. At the end, the participants pose for a polaroid photo to remember the day by. Ms. Leßman chooses a big sun hat, Mr. Krüger poses with the inflatable duck. 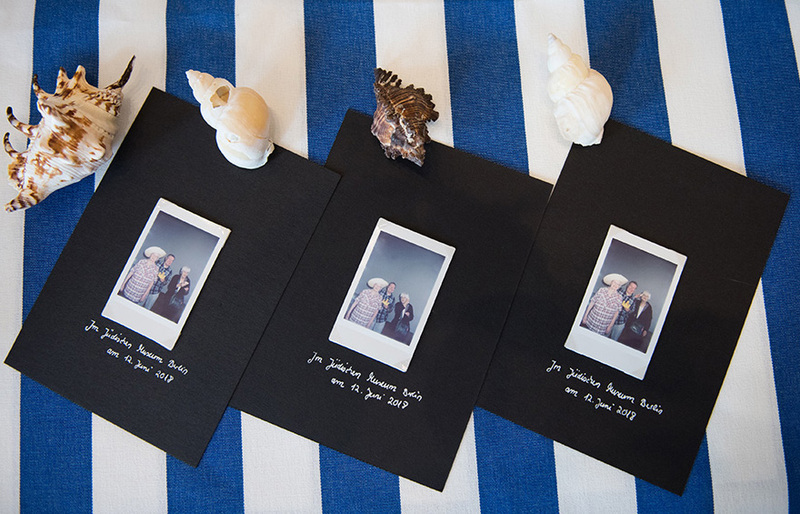 Afterwards, we create a souvenir for them to take home by pasting the pictures onto labeled cards. The cards will remain—even if tomorrow some of the participants won’t be able to remember their visit to the museum. What About the Topic of Judaism? As for how the participants reacted to our core topic of Judaism, after this first round we can say this much: some were interested and open. One woman remarked that they had talked about “this topic” in school. Another said she was glad that religion hadn’t played a very big role this afternoon, as she had apparently expected. As they were leaving, Herr Krüger shook my hand and said that he would have liked to learn more about Israel and the Jewish people. 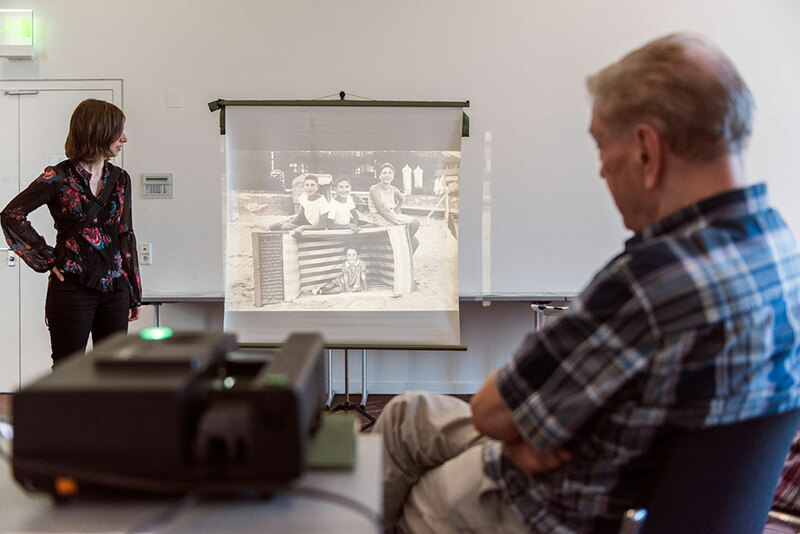 Thus, it’s absolutely possible to offer programming in our museum for people with dementia, even without an intellectual discussion of German-Jewish history. This programming is much more about participation—in cultural events, at the museum as a place for experiences, in society. 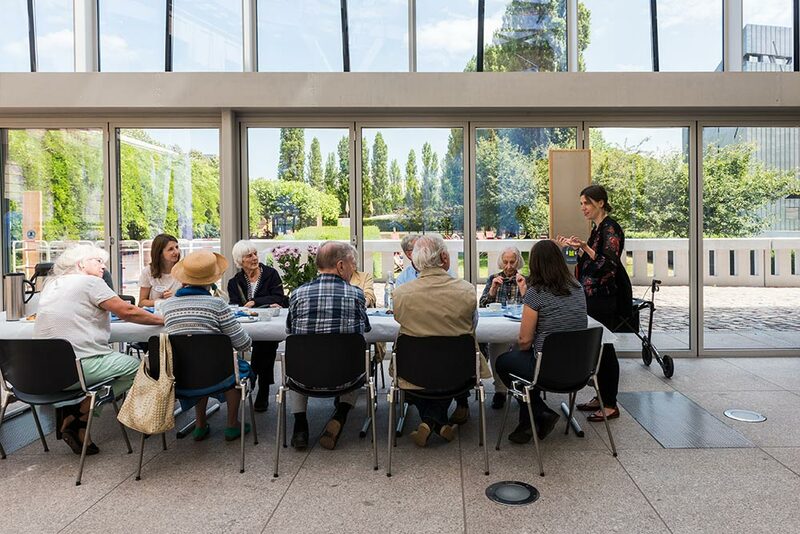 Susanne Schuur had little contact with the topic of dementia before receiving training in cultural programming for people with dementia (dementia+art ) at the Gemäldegalerie in Berlin and having some professional exchanges with an expert for cultural work with the elderly. Now she is completely convinced of the relevance of these educational offerings. You can find the next dates of photo presentations for those with dementia on our events calendar.